When an organization organizes an annual banned books week to celebrate "the freedom to express one's opinion even if that opinion might be considered unorthodox or unpopular," it is a little disturbing to see the same group cancel a panel discussion because one of the invited speakers is considered objectionable. But that's how the American Library Association (ALA) handled pressure from the Council on American-Islamic Relations (CAIR) to silence an invited speaker for a panel discussion at its annual convention who has a perspective on Islam, jihad, and terrorism that CAIR doesn't like. Jihad Watch director Robert Spencer, author of eight books on Islam and jihad, had been scheduled to appear July 12 on an ALA panel entitled "Perspectives on Islam: Beyond the Stereotyping." ALA canceled the panel after the other speakers decided to boycott the panel due to Spencer's participation. 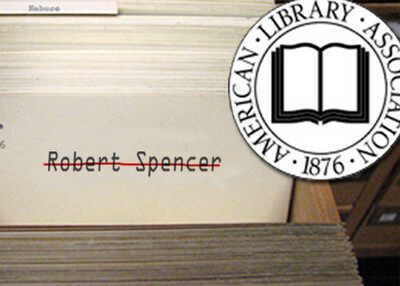 But rather than inviting others to replace them, or letting Spencer honor his commitment, the ALA capitulated and gave the critics what they wanted. CAIR spearheaded the drive to silence Spencer. In a letter to the ALA, CAIR-Chicago Executive Director Ahmed Rehab said he agreed in principle with promoting a diversity of opinions and opposing censorship. Still, he wrote "I ask you to rescind the invitation to Mr. Spencer in order to maintain the integrity of the panel and the reputation of the ALA." Spencer, he argued, offered "grotesque viewpoints that lie well outside the bounds of reason and civilized debate." This complaint is from a guy who can't bring himself to condemn terrorist groups Hamas and Hezbollah, who has minimized the depth of the Holocaust and claimed Jews control the media. Agree or disagree with Spencer, the episode is the latest in a series of successful efforts to silence viewpoints considered offensive to, or critical of, radical Islam. Random House Publishing withdrew its commitment to publish the novel, The Jewel of Medina, after a professor warned it might trigger a violent backlash in the United States. The book is a fictionalized account of Aisha, the child bride of the Prophet Mohamed. Maine officials are trying to fine the Christian Action Network (CAN) $4,000 for mailings the state considers to include an "inflammatory anti-Muslim message." CAN sent Maine residents a mailing critical of a proposed school curriculum on Islam that would have "students to pray to Allah, dress up as Muslims, adopt Muslim names, and learn the five pillars of Islam." Similar exercises for other religions are not a part of the program. Organizers of two meetings that each were to feature controversial Dutch parliamentarian Geert Wilder saw last-minute cancellations from their host hotels. In Nashville, hotel management cited safety concerns. In West Palm Beach, the Florida Security Council is suing to determine whether outside pressure led to the hotel's action. In the ALA case, there is no doubt about what happened. Spencer is considered "controversial," but so is anyone who challenges the conventional wisdom of the mainstream Islamist groups like CAIR, ISNA, and the Muslim Brotherhood, or who is a critic of Sharia like I am. Director of the Islamic World Studies Program and Professor in the Theology Department Loyola University Chicago. Columnist and author of 8 books on Islam and jihad, including the New York Times bestsellers The Truth About Muhammad and The Politically Incorrect Guide to Islam (and the Crusades). Director of the weblog, Jihad Watch, a program of the David Horowitz Freedom Center. "While I heartily endorse the principles of free expression and diversity of viewpoints that are part of the ALA mission, the way in which this information session about Islam and Muslims for Ethnic and Multi-Cultural librarians was modified and politicized at the last moment raises serious concerns about the integrity of the session." Hermansen did not explain why she characterized something she had known about for six days, and that had been publicly announced by the ALA nearly a month before, as a "last moment" change. It is also noteworthy that Hermansen's July 6 email was published by Ahmed Rehab, Executive Director of CAIR-Chicago, in a July 14 piece on the controversy that he published in the Huffington Post. Informed sources have revealed that the ALA's Appel worked closely with Rehab to satisfy CAIR's complaints about the panel, and even invited him to join the panel with Spencer, Hermansen, and the others. CAIR subsequently pressured the other panelists to withdraw, until finally, with Spencer the only remaining participant, the ALA canceled the panel. Appel told Rehab, according to sources close to the situation, that she wanted to disinvite Spencer, but would be accused of censorship if she did so. The indirect method was a face-saving solution. And then, according to CAIR, the ALA agreed to work with CAIR to "schedule a future event on the same topic as the canceled panel discussion." In its frenzy to placate CAIR, the ALA does not seem to have taken any notice of the fact that CAIR is an unindicted co-conspirator in a Hamas terror funding case, whose operatives have repeatedly refused to denounce Hamas and Hizballah as terrorist groups. Several of its former officials have been convicted of various crimes related to jihad terror. Several of its other officials have made Islamic supremacist statements. CAIR also was involved in the "Flying Imams" intimidation suit against the passengers who reported their suspicious behavior. It is disturbing to see the ALA acquiesce in CAIR's attempt to silence Spencer's perspective, and uncritically accept the organization's defamatory characterization of him as a "bigot" – a term CAIR officials throw at anyone who exposes the nature of their organization and who works to resist the advance in the West of the global jihad in all its forms. Most disturbing of all is the fact Appel and other ALA officials seemed unconcerned about CAIR's ties to jihadist and Islamist organizations such as Hamas and the Muslim Brotherhood. And so they have set yet another precedent in which a group with numerous ties to terrorist and Islamist organizations determines what Americans will learn about Islam, jihad, and the terror threat. What's the point of having principles if they are so easily tossed aside in the name of political correctness? Let's do something about censorship. Let's bring pressure to bear in defense of the honorable Robert Spencer. What can we do to boycott or write letters to people with power who can force spineless bureacrats and gutless wimps to allow free speech in pursuit of truth. Many American companies and organizations have voluntarily removed their own spines for fear of some type of "discrimination" or "hate" lawsuit. Will it end? No. Not until they re-insert their spines. Is it possible that the ALA could be so clueless about the anti-intellectual aspect of Islam. How many shelves does a library need to display the Koran. The ALA is a form of government- an agency created for the purpose of controlling a population. We need to use our right as citizens to alter it, and create a new organization that has a principled foundation. By the way, this idea works for our federal government too.